The 4 sessions of conferences involved no less than 24 expert speakers from companies such as Ford Motor Company, Gazelle Tech, Mercedes Benz, Owens Corning, Porcher Industries, SikaAxson or Wabash National Corporation, to name a few. The speakers put the stakes of mobility into perspective while highlighting the countless contributions made by composites, both now and in the future. On the first day of the event, Martin BIGRAS, Senior Expert Engineer - Composite Materials at Bombardier, gave a keynote speech on New Material Development for Rail Applications, addressing how composite materials are a great fit for the rail industry, the issues faced by composites in rail applications, and the envisioned solutions to further their integration into this industry. Another keynote speech given by Greg BEISER, Director – Future Mobility/Smart Cities at Faurecia, focused on Composites in Clean Mobility. 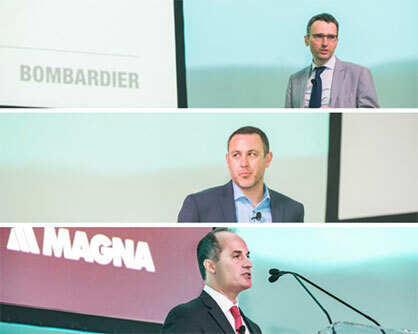 Paul SPADAFORA, Global Vice President of Product Development at Magna Exteriors, addressed the topic of Composites Innovations Enabling Future Mobility, focusing on connected and autonomous vehicles as an introduction to the JEC Innovation Awards.